We listed up our recommendations for you ! MonotaRO offers Torque wrench and more. You can buy them anytime from our Singapore online store. Direction: (Load direction) right, Purpose: Tightening work which oil is deposited such as auto maintenance, construction field, etc. Tightening work with gloves on. Assembly of electrical related equipment. *As it made of metal, it can be ESD countermeasure. Torque management screw size is about M, Tightening work which oil is deposited such as auto maintenance, construction field, etc. Tightening work with gloves on. Assembly of electrical related equipment. *As it made of metal, it can be ESD countermeasure. Torque management screw size is about M3 - M20. Accessories: Battery exchange driver, AAA dry cell battery x2 (for test), blow case, inspection result chart, instruction manual, Specification: Ratchet gears number/52, Power: AAA -- type dry-cell x2, Catch-Phrase: High precision fastening work can be done easily! See more results of "Torque wrench"
Check our Connection spanner and Torque Driver here as well ! 1/2"sq. WHEEL NUT TORQUE WRENCH SET and Torque Wrench, best offers by MonotaRO ! 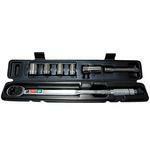 Torques wrench and Torque wrench with Postfix and many other offers.